M's parents were in town this weekend and it was a lot of fun for both M and myself. Although I've been up to Sweden a few times this year, it has always been in conjunction with some kind of event (e.g., weddings) which sometimes means that in the midst of all the frantic activity, there is not that much time to talk. This weekend, thus, felt like the first time that we got to spend "quality" time together since M and I got engaged. Although the weekend is not a long amount of time, I feel like we were extremely active and got a lot done. My favourite activities of the weekend were afternoon tea at The Capital and finally getting to watch Wicked after years of desperate wanting to see it. My verdict on the musical? Absolutely worth the wait. In fact, it is probably one of my favourite musicals of all time. Food, of course, featured heavily as well. Besides afternoon tea, we took them to Eight over Eight, a pan Asian restaurant in Chelsea, for dinner. M's parents were also kind enough to bring 1.35 kg of candy for M. If you know any Swedes then this probably doesn't surprise you. At least as of 2001, Sweden topped the world for non-chocolate candy consumption. Our new stash of candy! To cap off the weekend, we also hosted M's parents at our home for a home-cooked meal. Now, I must admit that preparing this meal caused me a fair amount of stress. M's parents have been readers of my blog and until Sunday, had never tasted any thing I've made. Thus, I felt under some pressure (all self-inflicted of course) to serve them a good meal. Besides, I didn't want them to think that I couldn't keep their son well fed. So, I planned a four-course Chinese dinner that would be capped off by an Asian-inspired dessert and some homemade fortune cookies. All in all, I made minced pork in lettuce wraps, poached sea bass, lily in the wood (bok choy with dried chinese mushrooms) and kung pao shrimp. Dessert was a molten chocolate cake with a matcha (green tea) filling. Since I had also spent the afternoon baking, we also had a second dessert course - coconut cupcakes with marshmallow frosting (more in another post). Unfortunately, in my haste to get dinner served, I didn't get any good pictures so you'll have to take my word for it. (That's what you get for being too lazy to set up the tripod). The photo you see above of the lily in the wood was the only picture I managed to take that was non-blurry. Despite the lack of photographic evidence, however, it was, for me anyway, an evening to remember. Bring a medium saucepan of lightly salted water to a boil over high heat, and keep it at a low boil. Heat a large wok over high heat. Add enough vegetable oil to come 1 inch up the sides of the wok, and heat it to 300F. Add the mushrooms and gently stir until they are shiny and glossy with oil, about 1 minute. Using a wide wire-mesh strainer, transfer the mushrooms to a colander to drain. Discard the oil. Return the wok to high heat. Mix 1/2 cup of the stock with the soy sauce, rice wine, 1 tsp of the sugar, and they oyster sauce in a small bowl. Add to the wok, and return the mushrooms to the wok. Bring to a boil. Reduce the heat to medium and simmer, uncovered, until the sauce has reduced by half, about 2 minutes. While the mushrooms are simmering, prepare the boy choy: Return the saucepan of water to a boil, add the bok choy, and cook until crisp-tender, about 1 1/2 minutes. Drain in a colander. Heat another large wok or a large skillet over high heat. Add the 2 tbsp vegetable oil and heat until shimmering. Add the boy choy and the remaining 1/2 tsp sugar, and stir-fry for 30 seconds. Add the remaining 1/2 cup chicken stock and bring to a boil. Dissolve the cornstarch in 3 tbsp cold water in a small bowl. Stir half the cornstarch mixture into the mushrooms, and stir the remaining half into the bok choy. Add the sesame oil to the mushrooms. Transfer the bok choy to a serving platter, and arrange in a circular pattern with the leafy tops in the center. 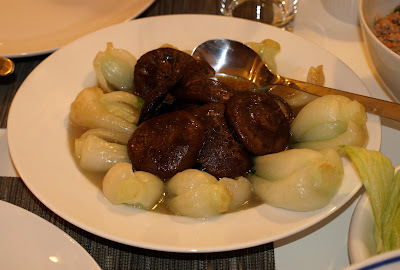 Place the mushrooms in the center of the bok choy and serve immediately.